Squashblog has been published today. It seems that because I started the draft document on 27th October, that is where it is!... see below and enjoy! Welcome to Matron's Squashblog. Many thanks to all of you who contributed, I have posted them below with a link to your blog. I hope you enjoyed my contribution above, he's got a face only a Mother could love, hasn't he? 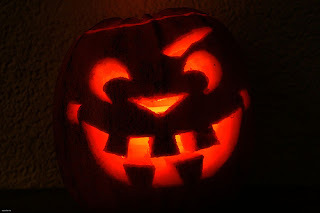 The origins of Hallowe'en date back over 2000 years to the ancient Celtic festival of Samhain (pronounced sow-in). This festival, which means the end of Summer, celebrated the end of harvest and the beginning of the Celtic new year on November 1st. All Saints' Day is said to fall on this day when souls walked the Earth. In early Christian tradition souls were released from purgatory for 48 hours on All Hallow's Eve. Spooky! Here is a contribution from Hels Blogspot quite an amazing feat when you consider that she has only a small window box and a balcony in her flat. What a gal ! Here you can see she has attempted yet again, to spell out her name in pumpkins.... better luck next time Hel ! Here is a row of little soldiers from Petunias-garden in Western Washington, what a wonderful example of the variety in size shape and colour. I can't claim credit for this picture! It was taken by DaVikka at Mogblog. 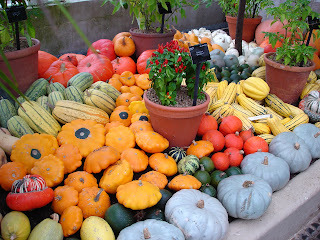 There was a pumpkin and squash exhibition at Kew Gardens last year. Missed it. 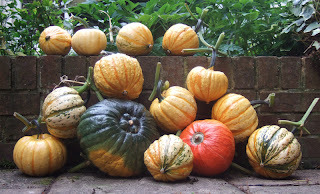 Incidentally, I have found a great website for interesting seeds, and a particularly good selection of pumpkins and squashes at Seeds of Italy so give it a look! Thanks to Stan, my blog-mentor at Naive Zebra, for this contribution. I was given an answer when I asked the question, "What happened to the other eyebrow?" - can you guess what the answer was? I really hoped that someone would send me a photo of one of these! Thanks to Judith at everything in the gardens rosie for her contribution! 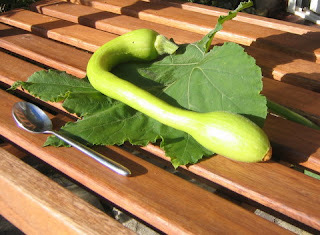 I think this is an Italian squash Tromba de Albegna - it is supposed to taste supberb. Has anyone tried it? It looks like you might be able to break into a car with it ! Here is an interesting shaped offering from Billie Jean at bjs allotment. Always a good idea to give them a comfortable layer underneath, to prevent damage as they grow. Otherwise they might end up just like Matron's pumpkin! Here is a wonderful coloured pumpkin from Anita at ein-stueck-garten . These are such a rich amber colour, makes the mouth water. I've picked my purple hyacinth beans. I think they probably need a longer growing season than I can provide here in Southern England, but I am pleased that I have grown them at all. I have brought them inside to dry off and to collect seeds for next year. 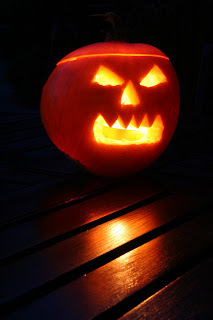 Just one more reminder to send me a photo of your best, most unusual pumpkin or squash for Matron's Squashblog. I will be posting on 30th October, so just time to take some pics and send them to Ahhmatron@aol.com. I will post them with a link to your blog. 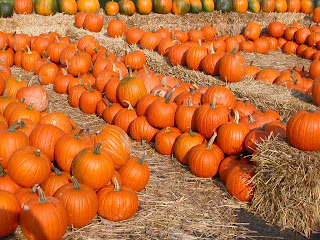 Following the amazing response to Matron's dogblog - I have been inspired in the past few weeks at the wonderful photos of all your pumpkins and squashes out there. 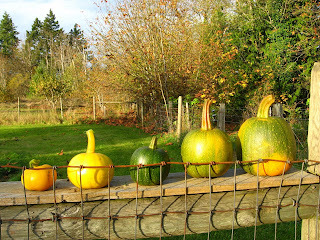 Thus inspired, I will be posting a Squashblog to celebrate all your weird and wonderful produce. I will be posting my blog on 30th October. Please send your best photo on an attachment to Ahhmatron@aol.com and I will post them all with a link to your blog. I can most highly recommend a visit to the National Fruit Collection at Brogdale near Faversham in Kent. Last year I made the journey and it was well worth it. Above pictured is a 'Medlar' which is a lesser known fruit related to a rosehip. This fruit is left to ripen over winter till really soft and ripe, almost rotten. This process is known as 'bletting'. The medlar has a lovely sweet nutty flavour. Incidentally, the French translation for medlar is 'un bout de chien' - literally 'dogs bottom' - you can see why! Quinces are coming to their best at the moment. Related to a pear, all the quinces at Brogdale are picked and shipped exclusively to Fortnum & Mason in London. All of them - except the windfalls which made their way into my kitchen for some delicious quince jelly ! Thousands of apple varieties to be found at Brogdale. Many of which are native to different counties in the UK and can be ordered from their shop. Also at Brogdale is the National collection of pears, plums, cherries... and the National collection of nuts ! !